...plus everything else you need to make your website work for you with the greatest of ease. Our forms have been unmasked! SOFTWARE IS ONLY AS GOOD AS ITS SUPPORT. The Data Springs philosophy is the very reason you will find the Data Springs module reviews on the DNN Store the highest in the industry. 389 Reviews and above a 4.5+ rating. Upgrade Policy. Ask a question about our modules. Dynamic Forms Demonstrations Contact us Custom Work? Get a quote here. DataSprings has consistently provided great modules and very good support. Chad, THANK YOU! You guys really are the best at support.! The Data Springs team is nothing but exceptional. I have never had such impressive support response by any company I have dealt with in the past. I highly recommend their products as they will stand behind everything. 5 stars!!!! Great collection and a must-have in the DNN module portfolio. Ok, we don't use all of the modules in the collection, but those that we do use, Registration, Forms and Tailored-Text in particular, have saved us hundreds of hours in development time. We have tried other modules that initially appeared to satisfy our requirements, but none had the flexibility and stability of the Datasprings ones. Quick to respond to support queries as well. Keep up the good work! My company has used many different Data Springs modules for many years wit great success and satisfaction. When we have needed technical assistance the support has been very good. We have been using the Data Springs modules several years. It started out as just looking for a usable module for creating quick contact forms, but we've since purchased the entire collection and get a lot of use out of all the great modules. These modules are super useful and often prevent us from having to create custom modules. Aside from an extremely solid suite of products, the support they offer is outstanding. They support the products very well. So a great set of modules, and great support, you cannot go wrong. Data Spring modules have become a foundational part of the turn key portals we setup. Dynamic Registration for example - we deploy with a default configuration and can quickly customize to whatever updates a client might want. Chad and team are very aware that our success is their success and have consistently gone the extra mile when we needed help. I can recommend their collection without reservation. Dynamic Registration, Dynamic Forms, and Dynamic Login are fantastic. The other stuff in the bundle is of mixed quality, but it is still a great value. VERY good support, so if you have some unusual registration process, this is the right product. WOW... If you want interaction .. you must get this module!! this module collection is unbelievable. A perfect companion to a stock DNN6 install and all the modules work great. Need help? The staff at Data Springs is willing to answer any questions you have. Dynamic forms is second to none! One of the best modules in this pack by far. Thanks for the hard work. Great collection of modules Support from Data Springs - Chad and Candace has been absolutely fantastic. Chad and his team at Data Springs continues to out do themselves and provide the best modules on the market hands down. From Dynamic Forms to Dynamic Modules to Dynamic Registration, they keep getting better. Integration with Dynamic Login to Facebook is paramount with todays socially connected audiences. I can't wait to see what Data Springs brings next. Support in the forums and directly is also amazing. Amazingly fast support. They are so helpful! The service from DataSprings and Chad in particular is terrific. For example, we encountered a problem on one of our sites with the Dynamic Login module. Chad took the service ticket and provided exceptional support in getting the issue resolved. Most impressive was the fact that the glitch was not related to their module, but to some hosting issues. Really went above and beyond. I justed started with DNN and purchased these modules to easily extend my site. The modules have done exactly that and have more features that I expected. I had some minor issues during my first setup mostly due to my DNN inexperience, and Chad at Data Springs helped me figure out what I was doing wrong. The support tickets say 24 hour turnaround, but at times it felt more like being on an instant chat. Being new to DNN the support is probably my favorite part of this collection. The modules and support provided by Datasprings is top notch. I have been using DataSprings modules for roughly two years and have been extreamely happy with the products, ease of use, continual improvements, flexibility, and documentation. A must have for great DNN websites! Datasprings Collection is a very good way to make your work perfect. 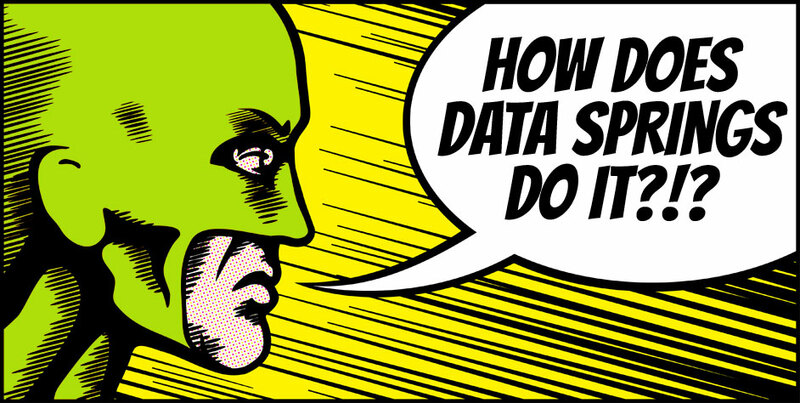 Setting up Data Springs modules is faster than a speeding bullet! Our hands-on support is more powerful than a locomotive! And our dynamic solutions will have you leaping over your competition in no time! Get your website up and running like a DNN SUPERHERO. Now more than ever, interactive forms are essential to your web presence. Thankfully, Dynamic Forms from Data Springs offers all the features you need to capture your data and create the workflow you need in your business. Need custom fields and workflow for your registration? Get all the power and ease of use to create the registration and profile management just the way you want it. The perfect compliment for extending your portals users and social community! An essential ingredient for managing dynamic user information is being able to search, filter and sort key fields and create useful user directories and custom report information. Add pizazz and functionality to your site login! Dynamic Login gives you custom templates, localization, redirection rules, SQL Validation, and Single SignOn. Want more? How about Facebook Connect, too? Your login has never been more exciting! Now you can have a feature-rich reporting module with custom defined templates and unlimited search options without the complex learning curve! This is the single best import and export module for users on the market, hands down. Interactive User Import provides you with the functionality to easily and quickly import users into DotNetNuke through a streamlined and well-documented wizard with many advanced features. Personalization allows you to go the extra mile in communicating and connecting one-to-one with your clients. Leverage the power personalized content on your DNN portal. Never pay a fee to send your newsletter out! Setup email campaigns to follow up with workflow. Relationship building and communication are two essential nuts and bolts for a business to prosper. 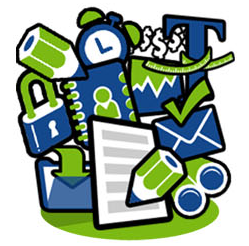 Manage your newsletters to generate continuous awareness of your website, products and services. Want to notify users that their role will expire soon? Renewal Reminder is your answer! Automatically send out emails to get your users to take action and renew their memberships. Don't lose your active (or paid) users to expired roles! Giving your site visitors relevant information is critical. With the Data Springs Stock Module you can provide your users with up-to-date financial information.